Square centimeters (cm2) is a unit of area, not unlike square inches. Finding the area of a shape or object in square centimeters is a two-step project. First, you measure parts of a shape, then use the appropriate equation to calculate the area of the shape in square centimeters. The way you measure and calculate objects changes according to the shape of the object. Since a centimeter is a metric unit of measurement, you must learn to use metric rulers or tape measures to measure square centimeters. Choose a measuring device that measures centimeters. If you are measuring the area of a small shape or object, use a 30 cm ruler. 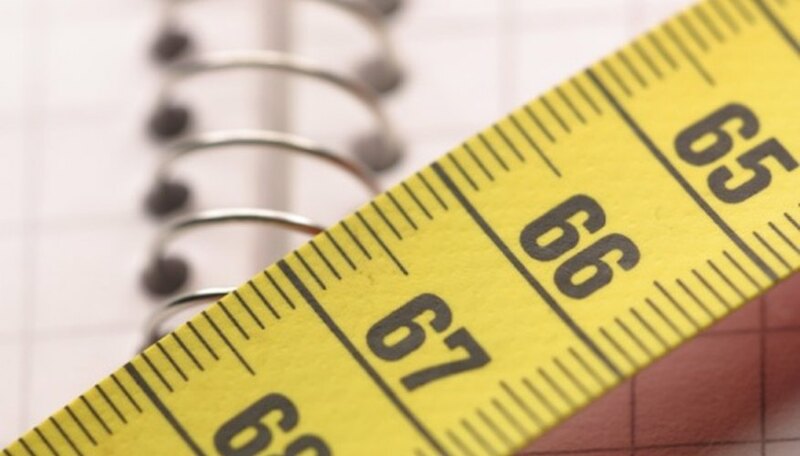 If you are measuring a large object or a room, use a metric measuring tape or meter stick. Use the metric ruler by placing it along the width, length, height or diameter of the shape. Place the "0" at one edge of the shape and note the number at the other edge of the shape. If the number is "20," the part of the shape you measured is 20 cm. Use a protractor to help measure parts of shapes, such as triangles. To measure the height a triangle, line up the bottom of the protractor with the base of the triangle. Put the 90 degree mark of the protractor at the corner of the triangle perpendicular to the base and mark where the vortex of the protractor sits on the base. Measure the height by placing a ruler between the vortex mark and the corner of the triangle perpendicular to the base. Take note of millimeters as well as centimeters for more accurate measurements. For example, if the part of the shape you measure is slightly longer than 20 cm, count the number of small millimeter marks between the 20 and 21 cm marks on the ruler. If you count four marks, the precise measurement is 20 cm and 4 mm, or 20.4 cm. Find the area of a rectangle in square centimeters by measuring the length and width of the rectangle in centimeters. Multiply the length of the rectangle by its width. If the rectangle has a length of 10 cm and a width of 5 cm, the equation is: 10 cm x 5 cm = 50 cm2. Find the area of a triangle in square centimeters by measuring the base and height of the triangle. Multiply the base by the height of the triangle and divide by two. If the base is 6 cm and the height is 3 cm, the equation is: (6 cm x 3 cm)/2 = 9 cm2. The base of a triangle can be any of the triangle's sides. Use the equation "square inches x 6.4516 = square centimeters" to convert from square inches to square centimeters. Online Conversion: How do I read a ruler? Jarvis, Miles. "How to Measure Square Centimeters." Sciencing, https://sciencing.com/measure-square-centimeters-8639973.html. 25 April 2017.